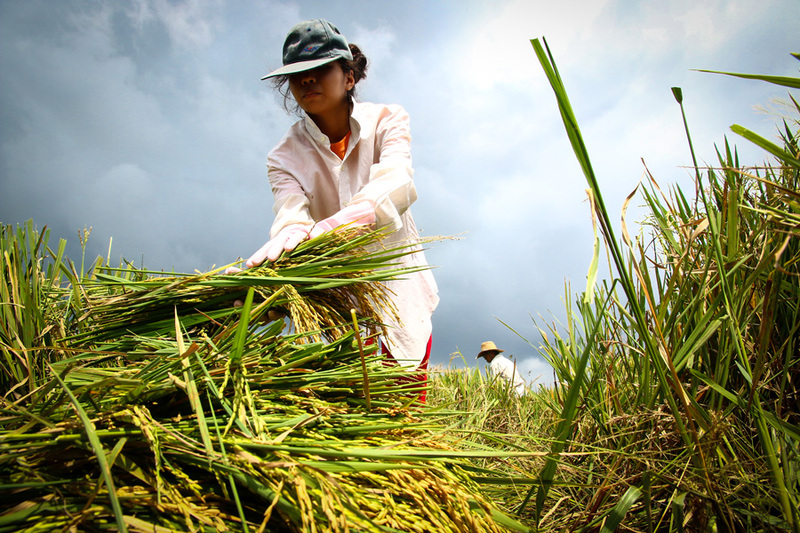 A researcher pushes the limits of radar data to monitor small rice fields in the Philippines. Every twelve days, agricultural engineer Ritche Nuevo took his meter stick, caliper, and a notebook to a small rice field close to his home. Nuevo lives and works in the coastal town of Argao, on the Philippine island of Cebu. When he was not teaching or spending time with his wife and kids, he was often at the rice field measuring growing rice plants. He kept a list of days to visit the flooded paddies that coincided with the European Space Agency’s Sentinel-1 satellite flying over the archipelago, 692 kilometers (430 miles) above him. Ranging from school bus-sized to small as a Rubik’s Cube, satellites orbit Earth several times a day. Whatever the size, most satellites measure continents and large countries best, particularly because they are so far away from what they are measuring. In the last few years, however, some satellites have been equipped with better sensors that can see Earth’s surface at very high resolution, or in more detail. Launched in 2014, Sentinel-1 was one of those satellites. “I was intrigued by the possibility of using Sentinel-1 data to monitor small-scale rice farms, which are common here in the Philippines,” Nuevo said. Nuevo wanted to find a way to track rice growth using Sentinel-1 to help small-scale rice farmers and agencies assisting farmers quickly estimate crop damage from droughts and strong typhoons. Storms blow through the Philippine archipelago from June to October, sometimes destroying crops with relentless rains and gale-force winds. Timely assessments of rice damage are crucial in rice-dependent countries like the Philippines, which would need to quickly import the crop to prevent an acute national shortage. Filipinos eat rice for breakfast, lunch, and dinner. Its flour form is a common ingredient in many beloved desserts, like puffy, steamed rice cakes called puto and savory-sweet pastries called bibingka. Unlike the sprawling, industrial fields of wheat and corn in the Northern Hemisphere, about 80 percent of the world’s rice is grown by farmers in small fields, in low-income and developing countries like the Philippines. If you fly a camera drone over the Philippine countryside, you will see smallish blocks of rice fields peppering the margins of rural towns and small cities. They rarely occur as large, contiguous crop fields. An individual farmer in the Philippines generally operates 2 hectares (5 acres), slightly smaller than the average 3-hectare (7-acre) Southeast Asian rice farm. By comparison, the average agricultural farm size in the United States is 180 hectares (445 acres). Rice is grown and harvested twice a year in the Philippines. At the beginning of every planting season, fields go through a process called puddling, where after flooding the land is plowed to mix and level the soil. Rice seedlings are then transplanted to the prepared field. It takes around three to four months for rice plants to mature. At harvest time, farmers collect the plants and then manually or mechanically thresh them to separate the grains from the straw. Farmers dry the grains and typically sell to millers. At the mills, machines hull and polish the grains until the rice germ and bran layer come off. Rice millers and traders sell processed rice as white rice and unpolished rice as brown rice. The Philippines’ National Food Authority (NFA) maintains the country’s buffer stock, a system that buys and stores rice during good harvest seasons to prevent prices from falling below a price level that might hurt the industry, and releases the stocks during seasons of bad harvests to prevent rice prices from rising beyond consumers’ reach. When inventories fall below the NFA’s 90-day buffer stock, the country imports rice. Because the country is smack-dab in the Pacific’s typhoon belt, it has not been able to produce enough rice to export. Instead, it buys rice from neighboring countries—such as Thailand and Vietnam—that are fairly sheltered from storms that develop in the Pacific. In Argao, Nuevo first needed to test the theory that Sentinel-1 data can be used to differentiate rice fields from other types of surfaces. He found a 6,320-square meter (20,730-square foot), or 0.63-hectare (1.56-acre) rice field in the beginning of its growing season, conveniently near his home and near the university where he worked. The field sat in the middle of other small rice fields, all separately owned and managed by different farmers. Nuevo collected field data from seeding in October 2016 to its harvest in February 2017, measuring a set of the plants’ physical properties that signal growth, such as height and number of stems that sprouted leaves and grains. The field sampling points, marked by bamboo stakes, were 10 to 30 meters (33 to 98 feet) apart, approximating the Sentinel-1 10-by-10-meter (33-by-33-foot) pixel resolution. He also selected grass covered ground, an area with trees, and an inland pond to represent ground, trees, and water surfaces to compare with the rice field. He then acquired Level-1 Ground Range Detected (GRD) Sentinel-1 data from the NASA Alaska Satellite Facility Distributed Active Archive Center. The Sentinel-1 C-Band Synthetic Aperture Radar (SAR) sends radar pulses to Earth, which bounce off different surfaces and are reflected, or backscattered, to the sensor. Nuevo plotted out a whole planting season’s worth of backscattered signals from his study site and the nearby sample sites for trees, water, and ground, and found the unique pattern for rice. 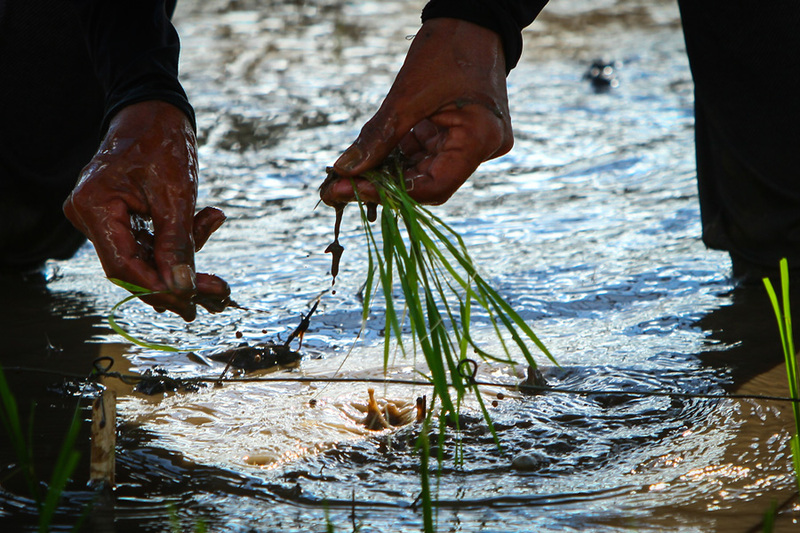 Backscatter dropped during the flooding and puddling of the rice field at the beginning of the planting season, whereas signals from the other surface types generally remained the same. This is because radar scatters in a forward motion when it bounces off a flat surface like a flooded rice field, resulting in low backscatter readings. As the crops grew and water levels in the paddies fell, backscatter from the rice field increased while backscatter from the other surfaces remained the same. Nuevo was elated. “Many studies have successfully identified and mapped rice canopies using C-Band SAR, but none have attempted to apply it at the scale of a single pixel,” Nuevo said. Would the data prove useful in detecting the actual growth of the plants throughout a growing season? And would it detect the lack of growth that might happen with storm damage? 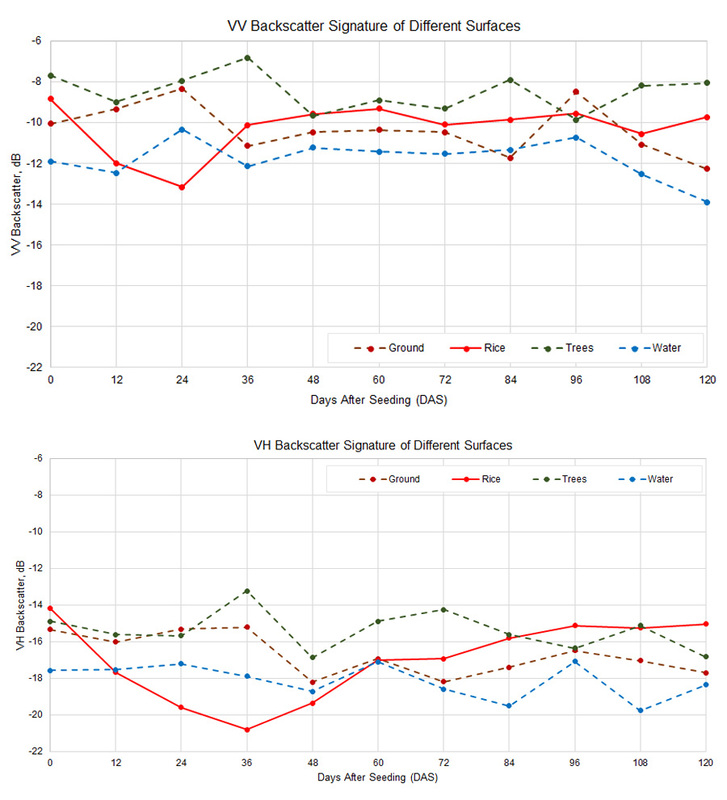 Nuevo ran an analysis of the field and satellite data and found that the radar’s Vertical-Horizontal or VH, backscatter correlated well with changes in the plants’ height and diameter, meaning the signals could sense subtle changes in these two parameters throughout the growing season. C-Band SAR sends and receives two kinds of signals: VH pulses are sent out vertically and received horizontally, and Vertical-Vertical (VV) pulses are sent out vertically and are received vertically by the satellite sensor. One final finding posed an exciting possibility. “I noticed that adjacent Sentinel-1 pixels can be very different from each other,” he said. Nuevo’s sampling points were 10 to 30 meters (33 to 98 feet) apart. 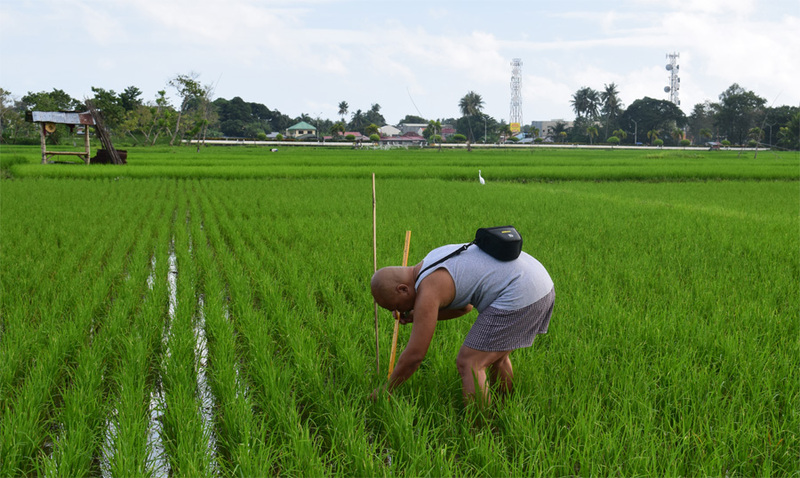 His analysis showed that his sampling points—all in one row and in the same rice field—produced slightly different backscatter readings from each other. NASA Alaska Satellite Facility Distributed Active Archive Center. 2018. SENTINEL-1A_DUAL_POL_GRD_FULL_RES. Fairbanks, AK, USA: NASA ASF DAAC. https://www.asf.alaska.edu/sentinel/data. Nuevo, R. U., R. B. Saludes, M. A. Dorado, and N. C. Bantayan. 2017. Monitoring of rice in small paddy fields using multi-temporal Sentinel-1 data. Paper presented at the 38th Asian Conference on Remote Sensing, New Delhi, India, October 2017. Royandoyan, O. M. 2015. Small farms and Philippine agriculture. 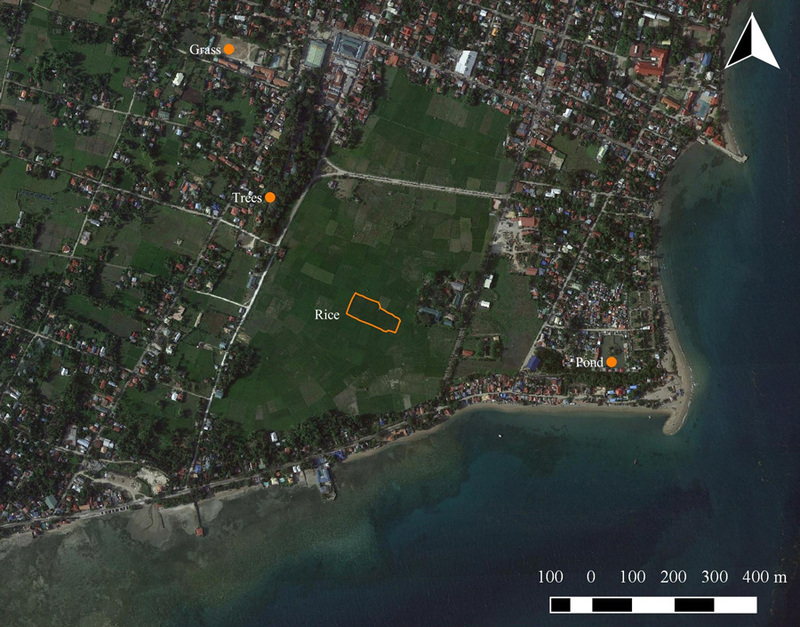 Paper presented at the Conference on Contested Access to Land, Quezon City, Philippines, February 2015.